I’m not even gonna pretend I’m not a huge nerd. 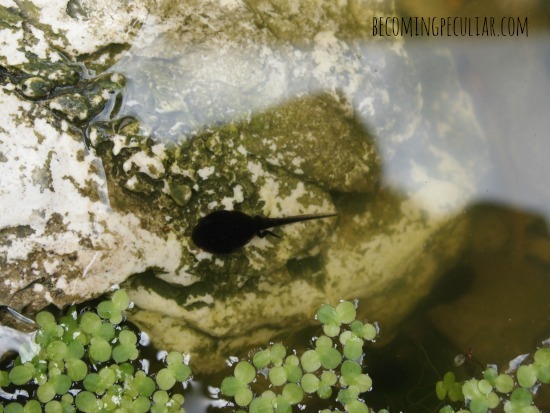 I LOVED raising tadpoles this spring, and watching them transform into tiny little toadlets! It’s one of the most exciting things I’ve done all year! I also learned a LOT. 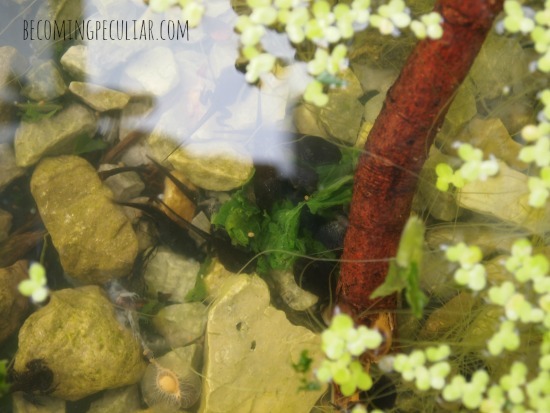 So if you’re interested in taking care of tadpoles, I’ve got some tips for you! 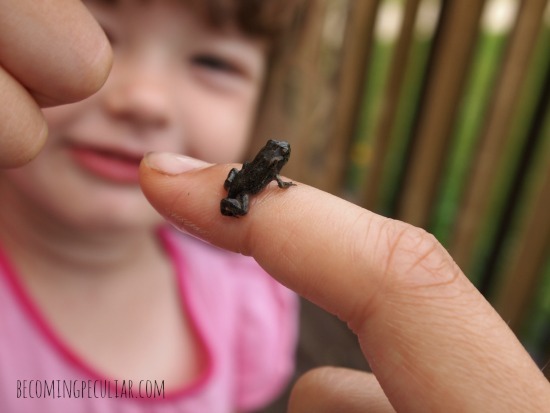 An acquaintance helped me figure out that the babies I’d raised were probably American toadlets. (I’m calling them “toadlets” because they’re still not fully mature — they will grow much bigger in the coming weeks). They took about four weeks to complete their metamorphosis (from mid-May to mid-June). When I first collected them, they were probably about 1 centimeter (less than half an inch) long, from nose to tail; and by the end of it, they were still about the same length . . . but completely different creatures! A quick Google search suggests that by the time they reach maturity, they will likely be 5 to 11 cm long (2″ to 4 ½”). Ostensibly, this was supposed to be a learning experience for Lydia, who’s turning three this summer. 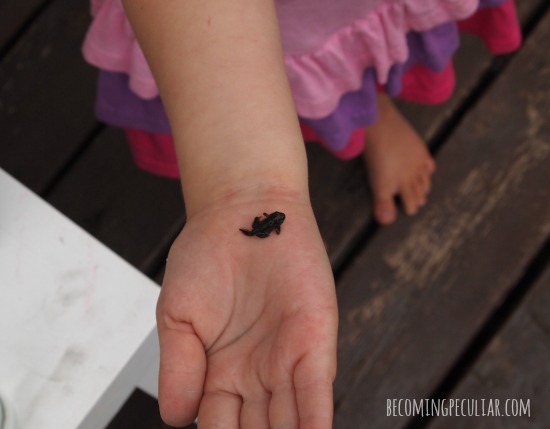 It was a chance for her to learn about caring for tiny creatures, and to witness the amazing transformation from tadpole to toad. I want her to experience wonder at God’s marvelous creation, which will hopefully encourage her to be a good steward of the earth as she grows up. And it’s true that she really enjoyed watching them and feeding them, and notifying me when a new toadlet had emerged. But in all honesty, it was mostly for me from the start. I find the whole process of metamorphosis absolutely astonishing. These creatures go from limbless, herbivorous, underwater creatures that breathe through gills, to little hopping, insect-eating creatures with full skeletons and lungs. Amazing! By the next week, they had little leg buds sprouting. And by the third week: legs! Their arms appeared very suddenly and without warning, at the beginning of the fourth week. I learned that their arms actually develop under the skin, and then pop out, elbows first. Hence the suddenness of their appearance. Who knew? See the little elbow just coming through? The rest of the arm was out a few hours later. Neat. And by the end of the week, fully-formed little toadies were hanging out on the rock. Their skin changes colour and their tails shrink rapidly once they have all their limbs. Awesome! We spent a lot of time examining them before letting them go, one by one. I’ve always wanted to keep tadpoles to get a chance to see this metamorphosis up close. This just happened to be my lucky year: my parents’ pond happened to contain thousands of little tadpoles, and my mom said I could help myself one afternoon when I was visiting. I borrowed their old fish tank, too. That same day, I found a big old (dirty) bucket, scooped up some tadpoles and pond water, and took them home. I just put the bucket in the back of my van and let them sit on the porch until the next morning when I was able to deal with them. And the next day I learned that I had made my first mistake. 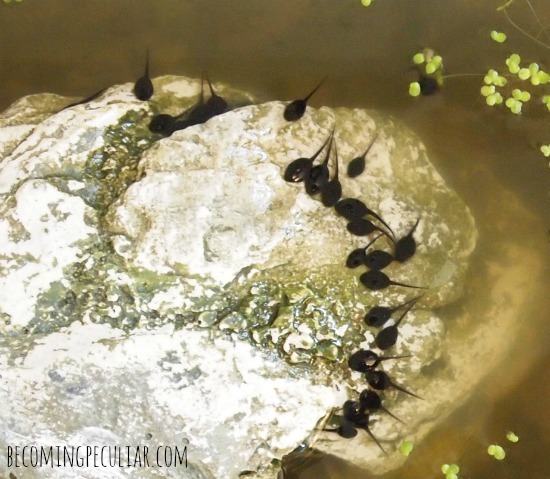 Before you get started, consider how many tadpoles you can reasonably house. Think about what you will feed them, and whether you’ll be willing to change the water every day for a month. I was so eager to get started I didn’t take the time to think through what I was doing. I ended up taking way too many tadpoles home — probably about a hundred! — and half of them died the first night. I’m not sure if it was overcrowding, or too much heat, or what; but whatever it was, it was not good. I had to spend the next morning separating the dead tadpoles from the live ones. It is smelly, tedious, time-consuming work. And I felt awful. I was an ignorant tadpole killer. 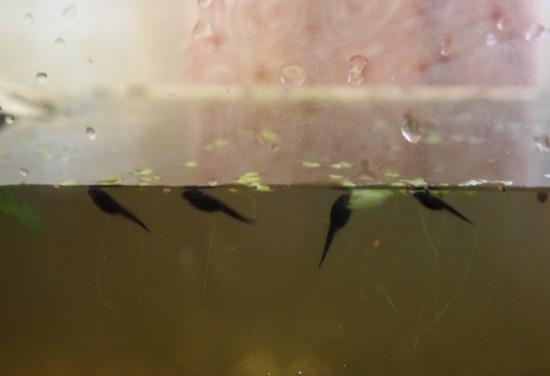 With bigger tadpoles, a good rule of thumb is one tadpole per liter of water (or 4 per gallon). Since mine were so tiny, I’d estimate that 2-3 per liter (8-12 per gallon) would be fine. My fish tank held about 2 gallons, so a safe number would have been 16-24 tadpoles max. NOT a hundred. Tadpoles need non-fluoridated, non-chlorinated water. This might mean you’ll need bottled/filtered water, depending on your tap water. Luckily, our water is not fluoridated. And to get the chlorine out, you just have to let it sit in an open container overnight. Every day, I filled a gallon ice cream bucket with tap water and let it sit until the next day, when I would replace half the tank’s water. Since my tadpoles came from stagnant water, I decided that it probably needed to stay that way — that’s why I didn’t install a filter/aerator. But that also meant I had to change the water every day, in a way that wasn’t too disruptive. First, I used a turkey baster to remove about half the old water from the tank. (After a few days I got pretty quick at this.) I then used the dechlorinated water described above. I usually just trickled in the fresh water over the rocks as gently as I could. The water stayed kind of murky, but I could still see to the bottom. 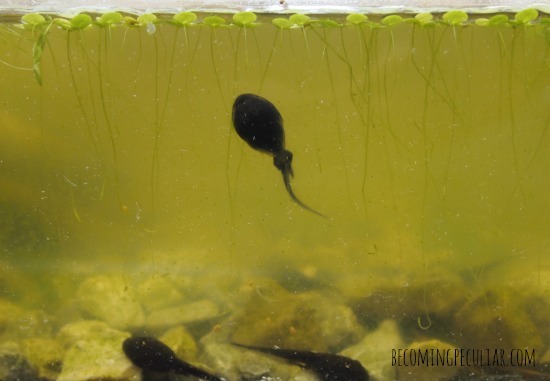 The temperature of the water affects how quickly the tadpoles mature. So you don’t want it to be too chilly unless you want them in your house forever. But you also don’t want to let it get too warm. A good idea would be to keep the tank in a place where it gets a few hours of sunshine, but no more. I left the tank out in direct sunlight for an entire (HOT) afternoon near the end, and a few toadlets died from the heat. Please don’t make the same mistake! After searching the Interwebs, I decided the best/easiest/cheapest food for my taddies would be boiled lettuce. (Luckily, it was in season and readily available from my parents’ house). It needs to be soft and finely chopped for their tiny mouths. 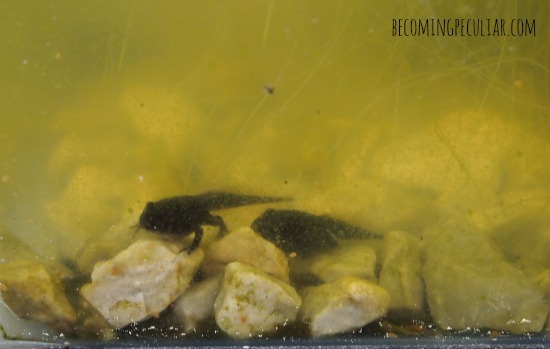 In the beginning, the tadpoles liked to rest at the edge of the rocks I kept in the tank. However, rocks that come out above the surface of the water are especially important in the later stages of metamorphosis. New toadlets need to be able to crawl out of the water — their gills stop working shortly after they have all four legs, and they can soon drown in the water that was their home just yesterday! The final stages happen rather quickly, so it’s important to have rocks in there ahead of time for them to climb. 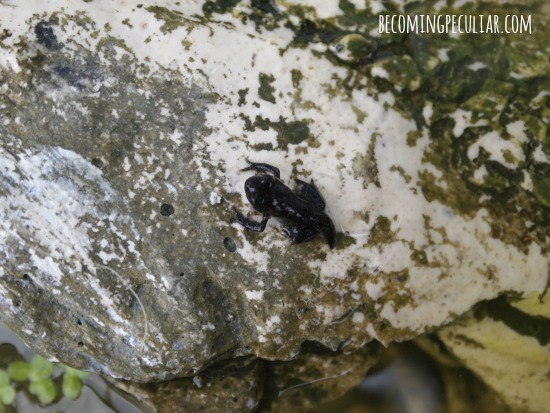 I was shocked to see little toadlets sitting on the rock the day after they started sprouting arms. Tadpoles go from plant-eaters to bug-eaters in a matter of days. And they only eat live bugs. 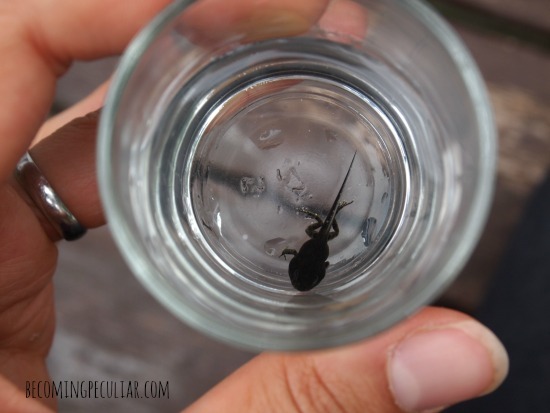 I wasn’t about to catch live insects for my tiny froglets (what kind? How big? HOW? ) so I decided to release them as soon as they had all four legs and started hopping. There you have it! Raising tadpoles is fun and rewarding! Have you ever done it? We did this when I was a preschooler. In my mothers very nice wedding salad bowl. All her idea. It was brilliant and I still remember it 26 years later. This is so neat! 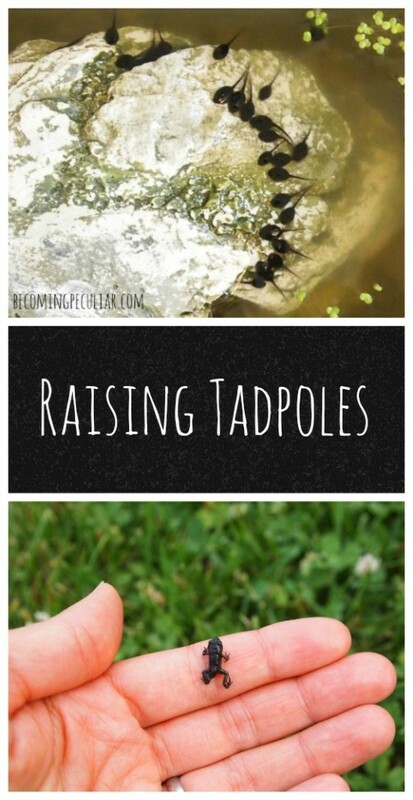 I’ve never even thought of raising tadpoles, but I can only imagine how cool it was to watch them grow and change. I had no idea their arms developed inside their skin and then popped out. Too cool. Thanks for sharing! 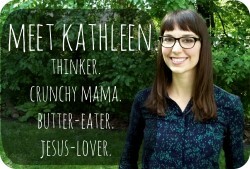 Amy recently posted..On great godliness and great evil. Nothing better for teaching children about the wonder of life than following the cycle of these beutiful little creatures. Spirituality and biology go hand in hand at the pond side. I grew up right on a pond/reservoir where hundreds of tadpoles hatched each year. I feel a little silly for having taken this for granted until reading your post. My siblings and I loved to watch them grow and then have the wonderful influx of little frogs into our yard every year. We occasionally caught two or three (sometimes right from eggs!) to keep as “pets” and raised them, but it was easier to just let them do their thing in nature. I never did any research on the matter, but I recall we gave them cooked lettuce, too. Not really sure how we figured that out. Cool post, though. Brings back good childhood memories! 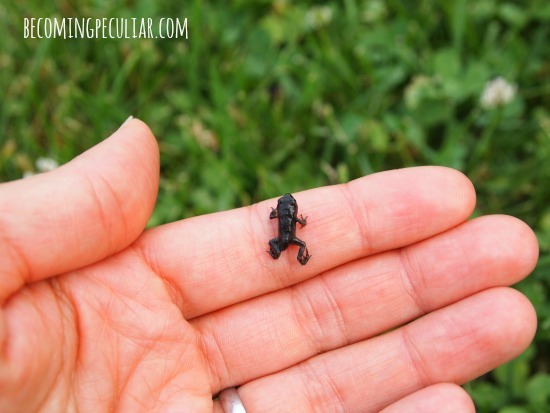 I realize this post is a few years old, but I’m wondering if you know whether the new toadlets need to be released near water or if they would be better off released in a shaded mulched area. We have been lucky to have some tadpoles in our backyard landscape pond and are finding the new toadlets in the skimmer area. They have all four legs and are resting on plants but can’t get out of that area on their own. I’ve been moving them to the other side of the pond, in the rocky waterfall area, but it gets quite a bit of sun and could be a little too warm for the new babies! I just thought they may still need to be near water. I’d love to hear your thoughts! Hi Jill! I’m so sorry, I wish I knew the answer to this question. I don’t think they need to be near water, but I’m not an expert. When we did this a few years ago we just released them in our shady back yard, near a field; but I have had my doubts about whether this was the best thing for them. Hope you find your answer! We are in the process of releasing about 50 toadlets and froglets. We captured the tadpoles from our pond and soon discovered that most of the ones we left, “disappeared.” (thinking it was the fish or mature frogs) So we felt we had increased their odds by removing them from the pond. We used large flat pans (the kind you put under large plants) to house them and we fed everything from lettuce to koi pellets. They ate some of everything we tried. We are releasing them into the rocks around the pond assuming that is where they would have emerged if they had survived the pond (a few did). The key is to have a moist area and lots of rock coverage. They need to find the tiny gnats and bugs right away as they don’t survive long in the tadpole enclosure without live bugs. I was thinking of supplementing with wingless flies that can be bought at some pet stores. I just raised like 50 and have another 50 they keep laying eggs in our plastic kid pool. I feed them fish food they love it they are neon green they can climb the walls themselves they just grow up and leave when they want I caught a few that would leave and come back and just sit on the top of the plastic container they lived in I walked some back to the creek and let them go we have tons of frogs around here sounds ridiculous when it rains brrrrrr brrrrrrrrrr brrrrrrrrrrrrrrrrrrrrrrrrrrrrrrrrrrrrrrrrrrrrrrr. I have read somewhere that tadpoles are sensitive to water purity. Is it right? Are there any animals that shouldn’t come close to tadpoles because they eat them? I got quite a few fishes and other animals already.